Copenaghen, Danimarca- Caro Kim ti scrivo… Caro Gerardo ti rispondo… Pubblichiamo il botta e risposta via Facebook tra Gerardo Seeliger, presidente onorario della Classe Finn e olimpico per la Spagna nel 1972, e Kim Andersen, presidente di World Sailing. 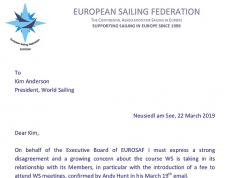 Nella sua lettera Seeliger riepilogava ad Andersen i motivi delle critiche a World Sailing riguardo alla discussa procedura che ha portato alla votazione della “Offshore Mixed Keelboat” al posto del Finn per Parigi 2024, segnalando come la reputazione stessa di Andersen fosse in gioco in questa vicenda. Kim Andersen ha replicato oggi scrivendo che si tratta di rumor senza prove e che la maggioranza dell’Assemblea ha ratificato tale votazione. Ovviamente Andersen non fa riferimenti alla decisiva attivita’ di lobbying della Federazione Francese (FFV) che ha messo nero su bianco in bilancio dei lobbysti per promuovere la classe a chiglia a Sarasota ne’ alle contestate procedure di voto, che hanno portato a un’assegnazione diversa di quattro voti, che sono poi risultati decisivi in sede di Council. A tal riguardo e’ in corso un’azione della Federazione Ungherese, il cui massimo dirigente Gyorgy Wossala e’ uni dei quattro memebri del Council il cui voto sarebbe stato mal assegnato. 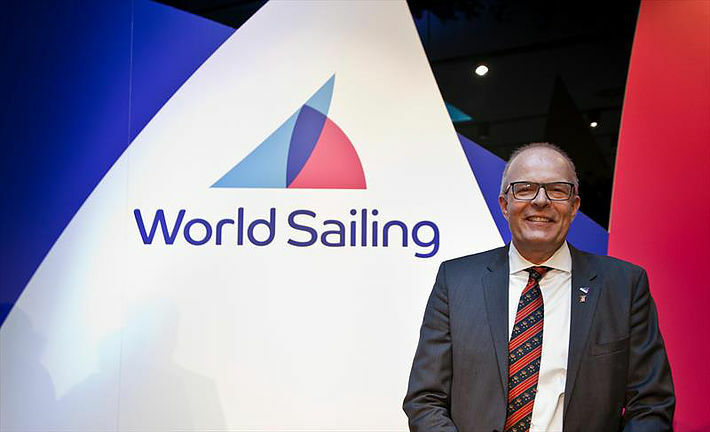 First of all, Happy New Year, success at WS and fair weather sailing in 2019. Your letter to Dr. Thomas Bach, President of the IOC, has now reached a wide audience. So has the email response from Gyorgy Wossala and the letter to you from the Hungarian Federation with some very specific questions, which many are waiting for clarifying answers. Providing prompt and clear answers is a proof to show your and WS commitment to leadership, transparency and exemplary Good Governance. I want to thank you for the time you took for the constructive, long and useful conversation you and I had a couple of weeks ago, just before Christmas. Gary Jobson, a longtime friend (together we created the Yachtsman of the Year Award many years ago and found the first sponsor) was also very useful to clarify certain points in a long conversation, to help me get an educated view on some of the issues below. I was in Palamos competing in the Christmas Race and actively listened to the young and senior sailors, to coaches and team managers. They all read the media related to WS and also get information from many different sources. Kim, we should be worried! Communication is such in the boat parks around the world that the sailors believe the rumors of what has gone on before, during and after the WS meetings in Sarasota and the last Council meeting. They are powerful damaging rumors and rumors get out of control. I want to convey to you, for your guidance, the rumours that are building up among our sailing community, who you as President and WS represent. • Suspicious voting process and outcome, some media call it “fraudulent vote”. The electronic voting system is being widely questioned, as is the “independent “audit afterwards. No transparency. • Choosing non-existing, untested, very expensive equipment and format for the 2024 Olympics, universally not available equipment (please note that although you campaigned that existing keelboats will be used for racing leading up to 2024 + boats will be provided for the 2024 Games, we all know that besides racing, 2-3 boat training incl. coach boat and other costs will lead to high costs, not to speak about rich nations buying a number of Olympic keelboats for more efficient training). Unequal and unfair within the Olympic culture. • The TV argument: TV interest for such an offshore event and format is questionable. Compare it with success stories: Weymouth women match racing final, Rio 49er women medal race, Sydney Hobart start last week,… Ask NBC, Manolo Romero, John Bertrand, Paul Cayard, Tom Ehman, Gary Jobson,… about truly attractive content to compete with other sports during the highly competitive airtime in the Olympics 16 Days of Glory. • Favoring rich nations over low budget nations, a serious challenge to the Olympic guidelines (imagine 18-19 year old young boys and girls organizing an Olympic campaign in an offshore environment instead of jumping into a dinghy in their local clubs). 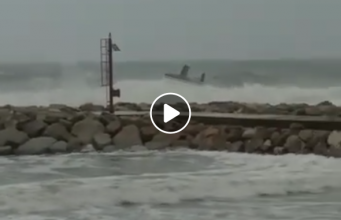 • Apparently a secret agreement with a boat yard, and being aware of a 150000 Euro promotional budget from an interested party for a keelboat event. I suggest WS must provide transparency and report how this money has been used. • With the board’s late submission not giving delegates the full objective picture of the issues with no time to a deep mature dialogue and discussion. • Finally, cultural and religious concerns in some countries of a mixed overnight event. Kim, all these are rumours, true or false, but they are damaging to you, WS and Sailing in the Olympic Family. The press and media are not your ally and are damaging you and WS too. I am passing this message to you, Kim, because the integrity of sailing, of our Olympic Federation and your own reputation is now at stake. I am speaking to you now a simple sailor, still competing and profoundly enjoying it, promoting sailing among young people. I have sailed dinghies and keelboats, sailed in the Olympics, 3 Admirals Cups, 2 Americas Cups, Chairman of CORC 1995, 2 Sardinia Cups. I enjoyed for years the best sailing mentor in the world, your countryman and mutual friend Ib Andersen. I volunteered in IYRU and ISAF for over 35 years in different roles and I feel, as a sailor, I understand the issues involved, neutral and objective, no commercial interests. Kim, the executive summary is that, from what I heard and read, there is a serious lack of transparency and a culture of “sailors first”. In all the accurate and well researched reports we all read in the media, there is a growing concern that the recent Council voting conflict and the last minute, urgent WS executive decisions related to the keelboat and the following voting are not transparent and affect your reputation. You gained this reputation through years of straight sailing, listening, straight talk and prudent , circumspect leadership. I have known you very well over 20 years. We have managed together complex issues, side by side in ISAF, always working for fairness, transparency and for the good of sailing. You achieved a substantial track record to be proud of, rewarded with the Presidency. I care about you on a personal basis, your credibility and the worldwide support from sailors, which you, as President of WS, an Olympic Federation, must continue to strengthen and enjoy. You have to listen to the voices of disagreement and look for viable solutions. Kim, don’t be influenced by personal, monetary and commercial interests of others. Please think of your own reputation, your credibility, the trust the sailors have placed in you, the integrity of sailing, the credibility of WS, which you are presiding, and finally WS as a member of the very demanding and hard to please Olympic Family. The IOC is a sensitive, prudent, fair, ethical, meticulous, risk and conflict averse organization. Real and perceived transparency of IFs is of utmost importance. As the damaging conflict inside WS spreads, which has probably already reached IOC members, it will affect your personal and the WS future within the IOC. The sole purpose of this letter is: 1) to make you and the recipients copied to be aware of the gravity of these issues and 2) inspire all of us to come up, constructively and internally, within WS, with the right choice for 2024. 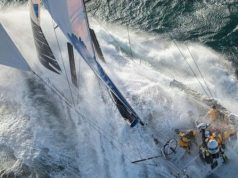 WE sailors know that in a storm approaching, we have to anticipate the weather, listen to the experienced sailors, take a reef, get rid of ballast, avoid rocks, and don’t sail against the currents and against the prevailing wind. Steer a prudent course and all sailors and crew to a safe harbour. I wish you fair sailing very soon again. Feel free to call if I can be of help. Thanks for your mail and the open talk we had before Christmas. When you say we should be worried, – I can say that I am worried about the rumors. But Gerardo, they are just rumors! Instead of referencing rumors you should not pass on rumors without having some kind of assurance whether they are rumors or not. As you mention these rumors are circulated around the world and from media without any objectivity or proof. But the media world today seems that the more you write, it the more is becoming the truth. So please check the rumors before passing them on. I can clearly state that these are vicious rumors passed around in the sailing community, but you need to stop them at the source. The facts that I know are stated in my communication relating to the process, when it comes to transparency, everything has been published not only from the events in Sarasota but also from all the rumors and issues from the May meeting and the rumors created regarding issues between the meeting. 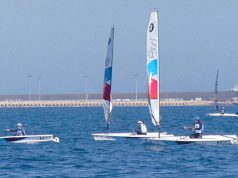 The same people supporting the rumors have been constantly supporting one specific class and that is not fair to anybody within our sport, the proof being that the rumors would cease if we would not have any changes in the Olympic equipment – that cannot be the values of World Sailing, being ruled by rumors. As the honorary President of the Finn class it’s important that you know that the Finn class was not part of the event in question. 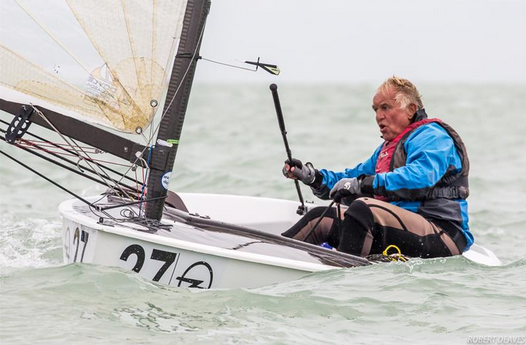 The event in question was the “Mixed one-person dinghy Event”, at the AGM three submissions where received against this event. One wanting to keep the slate of events at they are, but they were rejected as this was against the framework of gender equity and mixed events approved by a clear majority at the AGM in November 2017. The other two submissions were both submissions with the same content seen at the midyear meeting, one wanting to change the four mixed classes to two and getting the Finn into one of the spots. The AGM clearly did not want to change the inclusion of mixed events and rejected this proposal. The last one was the submission proposing to change the “Mixed One-Person Dinghy Event” event to a “Double-handed Mixed Offshore” event. You are questioning the new Offshore event, just to be clear double-handed Offshore Sailing is an existing discipline and is increasing in participation year by year. I am not sure how many Mixed One-Person Dinghy events we are having today? This probably is also why no proposal for equipment nor format was proposed to Council from any of the Committees during the week of meetings at the annual conference. The rumors are constantly talking about commercial interests, but where is this coming from? 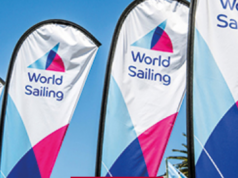 If we track all the contacts and allegations, this whole issue is brought upon World Sailing only driven by pure commercial interests from the manufacturers, not in the interests of the sport. As you know all the chosen equipment for the Olympic events where processes according to the regulations in place being manufactured one design or one designs and the manufactured one designs were invented on “you shift”, not mine. But I believe they are there for the right reason, selected for the benefit of the sport, according to a regulated process. From now on I will have to dedicate time and efforts to work on what was agreed by a clear majority at the AGM starting in 2017 and being the outcome of the AGM in 2018, rumors cannot have a priority. So Gerardo I can say that “ I am not influenced by personal, monetary and commercial interests of others”. You would know that I am doing this position in World Sailing on a complete volunteer basis and my values are still intact, but the game of using rumors and spam news is promoted by people within our sport against what was agreed with a clear majority in a process according to regulations, that’s a reason to be worried! But rumors damaging the sport should be dealt with at the source not by mistrusting the elected Board and by trying to talk about transparency from people promoting rumors. Dear Gerardo when you hear and read things please check the source and if in doubt don’t pass them on, for the benefit of the sport! See you in Copenhagen, – and the dinner invitation from our last talk still stands.